Guitar Hero and Rock Band changed the videogame industry, but that wasn't the only one: The music-game boom highlighted the relationship between games and music in a very unique and striking way. It's certainly not just a geek fantasy: You're on stage, rocking the hell out, shredding your totally sweet solo and the crowd goes wild. Guitar Hero let gamers live that dream - if only for a bit - but as it changed the games industry, so to did it change the music industry. Upcoming artists now had another way to get their "big break," and as Ruth Booth argues in Issue 235 of The Escapist, this only underscored the way that games and the music industry had interacted for quite some time. The best game soundtracks are more than just mood music - they actually tap into the culture that the games attempt to depict. Most of the people I talked to while researching this article cited either Grand Theft Auto or the Tony Hawk series as being among the first games where a guitar-based soundtrack really stood out for them, particularly the Tony Hawk games, where the soundtracks have mined first the punk and now the full alternative music culture that surrounds skating. 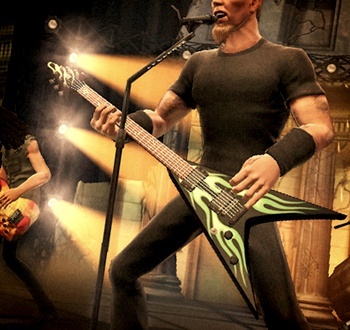 Similarly, games like Guitar Hero and Rock Band tap into metal culture, but in the most direct way possible: You don't just get to pretend to play a rockstar, you virtually get to be one. "Rock Band is basically karaoke for metallers," says Weir. "Not everybody wants to get up there and sing 'House Of The Rising Sun' or 'Beat It' when they've had a drink. But lads will quite happily get up and noodle around, whether they're good or bad or terrible." To read more about the symbiosis between games and music, check out "The Guitar Hero Effect" in Issue 235 of The Escapist.